In what came as a much unexpected move, Andy Rubin the Android chief of Google has been replaced by an Indian Engineer Sundar Pichai better known as P.Sundarajan, an executive in-charge of company’s chrome web browser and operating system for lightweight laptops. This has made Sundar as one of the most powerful executives in the internet World. “Going forward, Sundar Pichai will lead Android, in addition to his existing work with Chrome and Apps”, said the Google’s CEO Larry Page. Page has even mentioned in one of the blogs that Tamil Nadu Born-Sundar Pichai has a talent for creating products that excels technically and also easy to use.“Take Google chrome as example. In 2008 people questioned does the world need another browser? But, today chrome has hundreds of millions of happy users surfing the internet relying upon its simplicity, speed and security”, Page said. Page added, Pichai, a nine year Google Veteran,” would be doubling down on Android”. Hailing from the southern state of Tamil Nadu, Sundar was born in 1972. His educational background includes degrees in B.Tech from Indian Institute of Technology Kharagpur, an MS from Stanford University, and an MBA in Wharton School, where he was named a Siebel Scholar (A program that was established by Seibel foundation in 2000 to recognize the most talented students from the world’s leading graduate schools of business) and a Palmer Scholar. Sundar Pichai began his journey with Google in the year 2004 mostly involved in product management and leading the team of Google Chrome web browser. He was serving as a Vice-president of product management of the company. He was also involved in other search products like Google Toolbar, Chrome, and Desktop Search, Gadgets, Google Pack, Google Gear, apps for Google Maps and so on. Pichai has more than 15 years of experience in product management and in developing high-tech consumer and enterprise products. He serves also as a director of jive software since April 2011. Pichai passed out IIT Kharagpur in 1993, not only his metallurgical batch but also winning the Institute Silver medal for excellence in academics. Similarly just like Pichai, IIT Kharagpur metallurgical department has produced number of prominent personalities including Praveen Chaudhari, who headed IBM ‘s research division long back and Arun Sarin who was the CEO of Vodafone many years. Following the Google Chrome which was launched in 2008, ten months later, there came a need for the Operating system called Google Chrome OS which was created for those who mostly spent their time in the web and is being designed to power the computers ranging from small netbooks to large desktop computers. 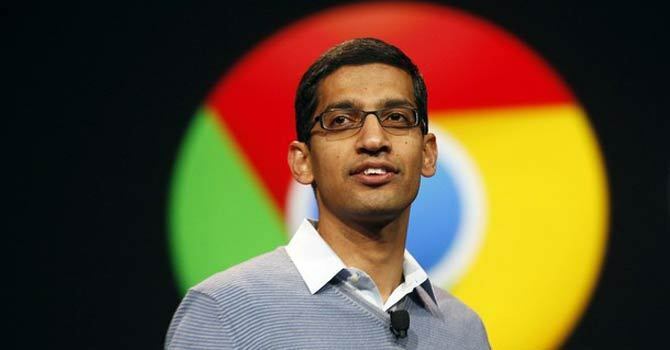 On November 19,2009, Pichai gave a demonstration video about the Google Chrome’s OS. Chrome OS is an open-source project that aims to build an operating system that is more reliable, secure, simple and fast. It has been mainly created to improve the experience of those who always stays in the web surfing, browsing,etc. In addition to that,On May 20, 2010, Pichai introduced a new video format webM to the public. He also announced the open sourcing of the new video codec VP8 by Google. And on the other hand, Google’s other operating system “Android” has released its latest version announcement in which the Android 4.4 will be called as “KitKat” Operating System. The company, which has been naming the versions of operating system ranging from cupcakes to jelly beans, had widely been expected to be “lime pie”as the next operating system but Google announced its latest version to be the name of chocolaty bar called “KitKat”. Sundar comments for the above release that Indians are disappointed with the latest release of operating system since they asked to name it as Android laddu or lassi or kajukatli. Thus, Sundar says no matter what people say, the next Android will be Indian flavored. In addition to this, the other recent release by Google is Chromecast which is a small affordable device that you can simply plug in to your High Definition TV and it allows to cast the online content of your mobile or laptop to the direct screen of the TV. It works with NetFlix, YouTube, Google play musics and so on. With this Chrome cast, you can cast the current tab of your chrome browser window to the TV screen and start listening to music, play games, watch videos, pictures and so on. These developments are made by Sundar Pichai and to listen to the detailed video of Sundar Pichai check on this link. Thanks for stopping by Dawatech. Keep on reading my blog. after reading this post..Indian surely feel some proud to be Indian…. Yes indeed. We have to proud about Sundar Pichai. First, i have to be proud that, he s a tamilian, then he s an indian. Here we just read about him, but he struggled lot to took up this position. This is really great. I can understand the pride you must feel with Sundar Pichai taking this position with Google. The world just keeps getting smaller when we all can work together regardless of what part of the world we live in. Thank you for sharing, Nirmal and have a great day. It’s nice to see your comment here. Yes i felt proud about Sundar Pichai. Because, as a Tamilian he got placed in Google. Thanks for stopping by. Keep coming to my blog Debbie. Hope to see you again.